Early on Saturday, March 12, 1938 German tanks and armored vehicles crossed the border into Austria, encountering no resistance. German newspapers printed a phony telegram supposedly from the new Austrian chancellor claiming German troops were necessary to restore order. In reality, it was an aggressive take over. The von Trapp family did not want to stick around. They had won first place in the Salzburg Music Festival in 1936 and gained some fame performing in Europe. Their departure to America would eventually become famous through the 1965 movie The Sound of Music, which won five Academy Awards. The family was headed by the Naval officer Captain Georg, a widower that remarried Maria in 1927. She became mother to his seven children and further developed their musical talents. It was under her direction that they became The von Trapp Family Singers. Maria and Georg had three more children together in 1929, 1931, and 1939. The Sound of Music was based on the first section of Maria’s book The Story of the Trapp Family Singers (published in 1949), although Hollywood added their own spin to it. For instance, the movie has Maria leaving a convent where she was a postulant in order to take a break and be a governess to the von Trapps. The truth is that she had come as a tutor for one of the children recovering from scarlet fever. Marie’s own health was not great, so a ten-month break before returning to the convent was the original plan. Maria had been orphaned as a young child and raised by an atheist relative. But while attending the state teacher’s college, she stumbled into a Catholic Palm Sunday Mass thinking there was a concert there. The priest’s homily stirred a spiritual awakening in her. After graduating as a teacher, Maria entered the Benedictine Abbey of Nonnberg in Salzburg as a novice. When the von Trapps departed Austria, they left behind a sizeable estate and prestige. In the U.S. they were able to support themselves as singers. Although the movie, had family friend Max Detweiler as their music promoter, it was actually a priest, the Reverend Franz Wasner who left Austria with them, that directed their career for over 20 years. In the early 1940s, the family settled on a farm in Stowe, Vermont and in between tour dates, ran a music camp. 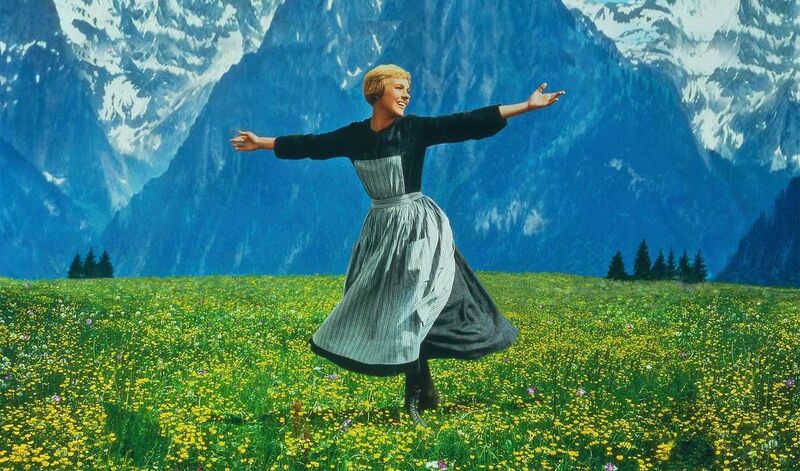 One thing that the von Trapps did not leave behind in Austria was their Catholic faith. They trusted in God to lead them and protect them in their new homeland. In the book, Around the Year with the von Trapp Family by Maria von Trapp, Maria shared how their faith directed celebrations of even small and long forgotten feast days. She included the music and recipes that were part of them. From Christmas Day: Once all are asleep, it is not, however a very long night. The morning finds us in chapel again. Having celebrated the “Angel Mass” at midnight, we return to the manger, together with the simple guardians of the sheep…. Dessert for Christmas dinner is the plum pudding, carried in ablaze with the lights turned out. On the evening of Christmas Day, we gather in the Christmas Room, light the tree again, and sing Christmas carols to the hearts’ delight. From Christmas to the New Year, there is the “Blessing of the Horses” and “St. John’s Blessings.” Regarding the latter: “According to tradition, the enemies of St. John the Apostle once presented him with a cup of poisoned wine intend to kill him. When the Apostle made the sign of the cross over the wine, however, the cup split in half, spilling the poisoned wine.” To go with the celebration, there was a special blessing and a little skit with the whole family. On New Year’s Eve, the family gathered to bring in the New Year and, in the morning, there was a Mass of thanksgiving. “Looking back over the past 365 days with their bright and their dark hours, we gave thanks for both the bright and the dark to Him Who knows what is best for us.” They dedicated the day to “fun and merrymaking” with games such as the “handkerchief game” and a treasure hunt. The menu included roast sucking pig and fruit punch with grated pineapple, ginger ale, orange juice, and dissolved currant jelly. Maria explained that in Austria, often on feasts of the Blessed Mother would be a pilgrimage to “Maria Plain,” an hour-and-a-half walk to the river to the foot of the mountain on which a three-hundred-year-old pilgrimage church stood. “All the way we would say the rosary, one rosary after another. At the foot of the mountain, we would light candles that we had brought along.” They would then attend Mass and visit the Church Inn for a big breakfast. Maria explained how they conducted their own family retreat. “If it is possible—and it’s amazing how many things are possible where there is a will—families should try to take a few days off together every year for a family retreat. If we have to stand the heat of the noonday together, we should also be together when we ask for and receive help.” It was a time when vocations were brought up and prayers for discernment were offered. Go here to learn more about the real Von Trapp family. And if you would like to experience the richness of their holidays throughout the year, Sophia Institute Press just republished Around the Year with the von Trapp Family by Maria von Trapp. They are having a 25% off sale. Use the discount code radio25 when ordering the book.